Teaching the next generation of OC Band Students. 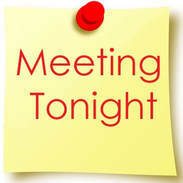 ​​Tuesday’s meeting will start at 7:30. We look forward to seeing you on Tuesday, February 12th in the Band Room. Remember, tonight is board nominations. Please let us know if you are interested in serving on next year’s board. It is a truly rewarding experience. We really need a treasurer, if you have experience, we'd love to have you join us. The good news, this year's treasurer will be around to help train and transition you into this very important position. What is band's role at Homecoming? Band will march in the OC Homecoming Parade. Students will meet at Jackson Stadium. Homecoming Parade starts at Gardiner Middle School & ends at Jackson Campus. A good place to watch is in front of the old high school on Jackson. Band will march into the stadium. Band will set up to play pep for the game. Boosters provide dinner for the band. Pizza, cookies and drinks. Band will perform the entire field show for the 1st time at the OCHS Homecoming game. Fireworks following the field show. This year's theme- Guardian's of the Galaxy. Parade starts at the Memorial Coliseum at 10:00 AM. Watch for us on the route and cheer us on! 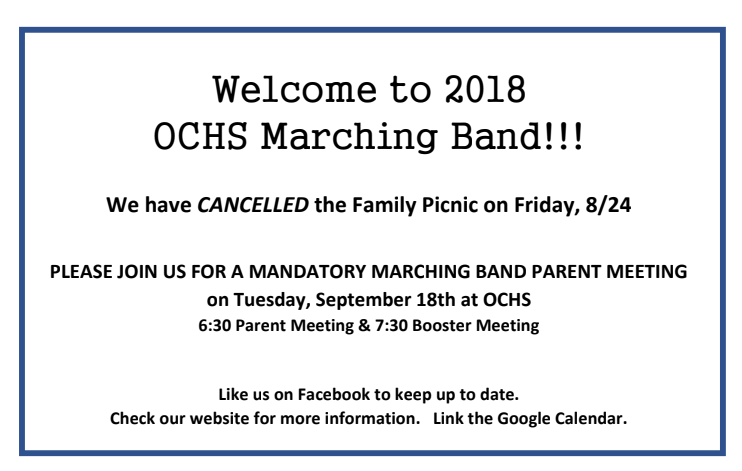 Lunch and Uniform Return following the parade at OCHS. New leadership will be announced and letters will be awarded. Missing a handout that came home from band class or marching band with your student? Looking for a Band Handout? Pep Band for basketball beginning in early January. ​Check the band calendar for dates, find the link above. Spring Marching will begin in early April. Fall Marching Season was a success. When? Orders need to be dropped off in the box in Mr. Henson’s office before the end of the school day on the drop off dates below. What If We Miss a Drop Off? If your student forgets, please call me and we can arrange for you to drop it off at my house before Sunday night. Pick Up Times: Generally scrip is available the following Friday at 3:00pm. Where Do We Pick Up? Room C107 at OCHS. For non-school Fridays, scrip can be picked up the next Monday or you can call me to arrange a special pick up time. Email your order to ocbandparent@gmail.com. I hope you all had a wonderful summer and got to enjoy your Labor Day Weekend! I will continue the tradition of sending a weekly email out with important information for the bands throughout the school year. Info will also be posted to our band website. We have also set up a new Remind for this year. I am looking forward to a fun and productive year of making music. Please make sure you have all marked your calendars for our Parent Meeting on Tuesday, September 18 at 6:30 pm in the auditorium. We will be discussing our marching band trips this year and going over general band information including uniforms, concert attire, and we will be answering your questions. We hope to see you there! Main Street Oregon City, Gates Open between 6:30 & 7 AM. 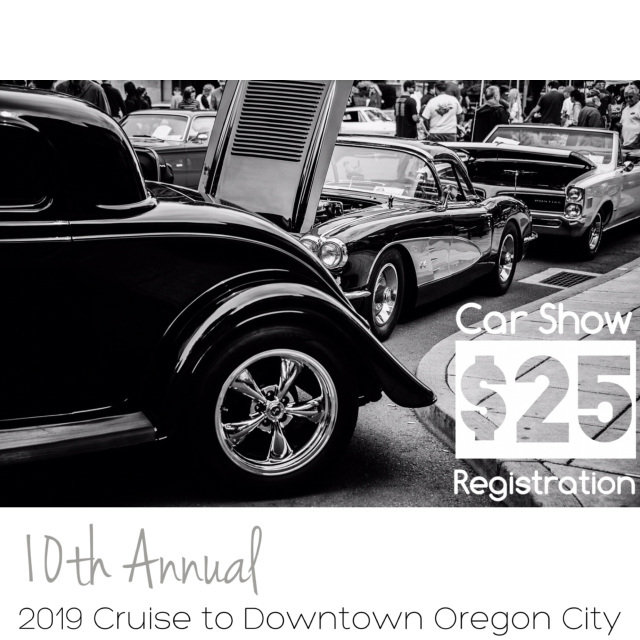 The entry point is at Main Street and 10th Street in Downtown Oregon City. 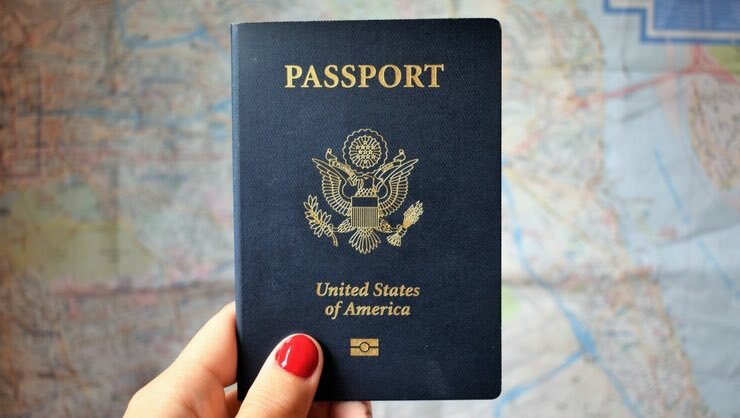 ​Would you like to be involved? Planning meeting May 1st at 6:30 PM at Oregon City High School. Would you like to sponsor a trophy? Trophy sponsors will be mentioned on promotional materials the day of the event, their name will be on the trophy they choose to sponsor, they may pick the winner of their class and present their trophy if they choose to. Would you like to perform during our event? We will be filling Liberty Plaza with tunes during the event. Are you interesting in participating? We welcome local vendor to showcase their goods and services. Please let us know if you are interested in participating. to the OCHS Band Program. The band will march in Florence's 110th Annual Grand Floral Parade on Sunday, May 20th. ​The parade starts at noon. The last time we marched in 2016 we took 1st place! ​There's a carnival and lots of fun to be had. Come on down, wave at us and enjoy a fun day at the beach. We will meet at OCHS the morning of the 19th and be driven by bus to the Teddy Bear Parade in Downtown OC. Saturday Meeting time to be announced. After the parade we will load the buses and travel to Newport where the kids can explore, get lunch (please send some lunch money with your child) and hang with their friends until we leave for our hotel in Waldport. Dinner and fun will be provided at the hotel. We will spend the night at the Waldport Alsea Resort. There is a heated pool. The following morning we will load the buses & head to Florence where Dana's mom and her auxiliary group in Florence will be providing us with a breakfast before the parade and goody bags for the trip back home. After the parade a hot dog type lunch is provided. On the way home we also normally make a midway stop on the way home when kids can buy a snack, & use the facilities. THANKS Mrs. Henson!!! We love you! Are you interested in staying and eating with the band? Saturday, 5/12/2018. Call-time 8:30 AM: OCHS. Please click the link above for the finalized plan for our trip to the Rhododendron Parade in Florence, Oregon. The information below is for all members traveling with the Pioneer Scarlet Brigade. We will load the buses and leave OCHS promptly at 9:15 am on Saturday, May 19th . We will travel to Downtown OC for the Teddy Bear Parade. After the parade we will travel by bus to Newport. Saturday, 5/12/2018. MEET @5:00 AM: OCHS. The Honors Wind Ensemble will be traveling to Corvallis this Saturday, May 12. We will be meeting at the school at 5:00 am and leaving at 5:30 am SHARP to travel to LaSells Stewart Center on the Oregon State University campus. Students are required to be in their concert attire in the morning prior to our departure. There will NOT be time to change once we get there. 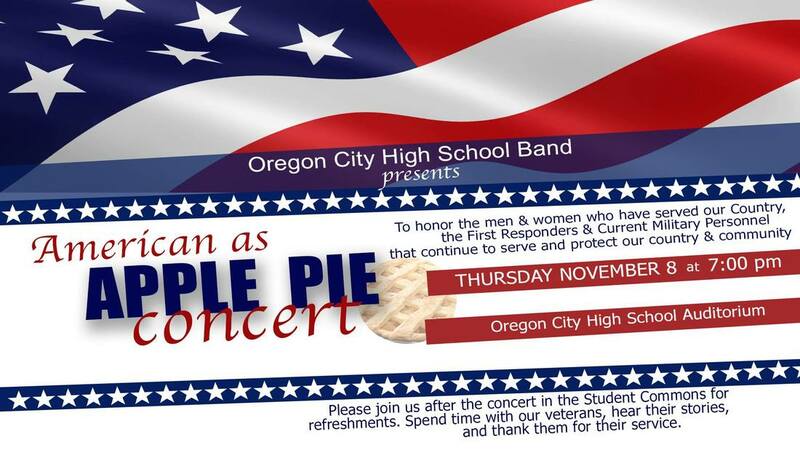 Students are encouraged to make sure they have all of the parts of their concert attire NOW. If students are missing any parts of their concert attire, they need to find those items before Saturday morning. We will have two buses taking us to Corvallis. Students should bring comfortable clothes to change into after our performances for the trip home. We will also make a stop for food in Albany on the way home. Students should pack food or bring money for this quick stop.